“Art of Fusion” is a perfect term to highlight Embedded Systems Technology, where it brilliantly combines the hardware components with the software programming in an innovative way. From the simplest electronic devices like calculators, digital watches, television remotes to the complex devices like the security and traffic control systems, embedded systems technology is being widely used to facilitate their efficient operation. So, what makes the embedded systems technology to be a standalone player in the electronics industry? With the recent advancements in the communication & processor industry, embedded systems technology is reaching new heights and thereby creating a great impact in the latest technologies. A number of emerging technologies like Artificial Intelligence, Internet of Things – IOT, Mechatronics (Industrial Robotics), Virtual & Augmented Reality etc are based on Embedded Systems. With such kind of contributions to the latest technologies, there is no doubt that embedded systems is going to emerge as a big player in the market in coming years. Being an engineering student, you need to understand the embedded systems from core to stay updated with the latest technologies and this will be possible only when you start learning the concepts by building good embedded projects. Since embedded systems is a very vast topic, you need to follow a systematic approach to learn it in order to master it. Ever since the industrialisation became an integral part to develop economies, most of the organizations began to research a lot on technologies that can improve the operational efficiency. Robotics is one such technology which is being actively researched to assist humans in complex industrial activities and improve the operational efficiency. For any robot to operate seamlessly, they are in need of a proper framework and internal structure. This is being provided by the embedded systems technology where it fuses the hardware components with the software. Any discrepancy with this fusion will cause a lot of difficulties in the robotics functioning, such is the importance of embedded systems in robotics industry. With a lot of sensors being used in the smart devices, tons of data are being collected and stored. Internet of things or IOT is an innovative technology that provides an efficient solution to solve this industrial problem. With the right kind of embedded system, IOT enables smarter collection, storage and analysis of the data collected from the sensors. And embedded systems makes it possible for devices to integrate the sensors and send the data to the cloud with ease. Even though a lot of research is being done on robotics to effectively replace humans in industrial process, there are still a lot of processes that needs human intervention. Mechatronics is an advanced technology that can be used to assist humans in doing such activities. It intelligently fuses the electronics and mechanical concepts to form a mechanism that can assist in such industrial processes. Fusion being the strongest advantage of embedded systems, developing mechatronics devices is only possible through embedded technology. With urbanization on the rise and as its growth rate reaches new peaks, most of the recent announcements from governments all over the world revolve around implementation of smart energy systems. The only way to tackle the energy crisis is to device an efficient energy plan that comprises of smart energy methodologies. Embedded systems facilitates easier integration of smart energy systems onto the conventional devices. Embedded systems not only provides an efficient integration but also provide that in a cost effective manner. Automation will be the first process to be implemented whenever the efficiency of a system needs to be improved. And it is possible in almost every system to integrate automation. But the biggest constraint in this is the integration of various systems, where a lot of hardware components and software is involved. Embedded systems makes this integration simpler and more feasible. Whether it comes to the automation of lighting systems or automation of railway gates, embedded systems technology integrates the hardware and software seamlessly. Hope you would have got some good project suggestions that help you to get skilled in embedded systems. 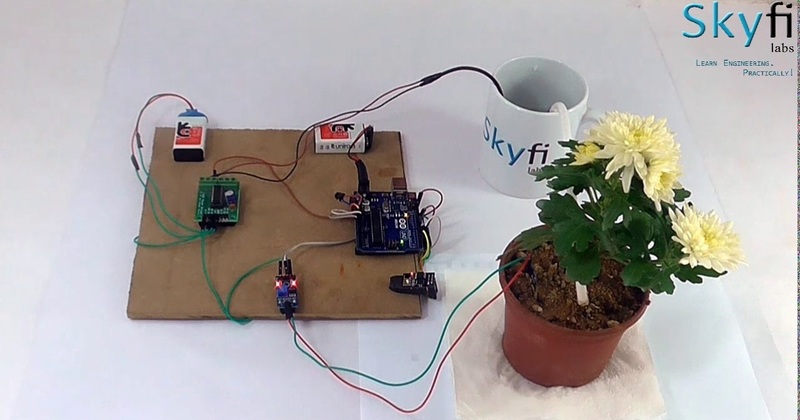 If you want to build great embedded projects but don’t know where to start, we at Skyfi Labs have developed an innovative learning methodology through which you can learn and build projects right from your home. With the hardware kits delivered to your doorstep and 1-1 technical assistance provided, developing great embedded systems projects will never be tough for you. Do let us know, what you think is the best embedded based project to build by commenting below.